If you've already maximized the horizontal space in your warehouse, distribution center, or manufacturing plant, you need to start looking up. Mezzanines and work platforms can greatly increase your square footage and get equipment and operations up off the floor. Perfect for warehouses and manufacturing facilities, we have many standard layouts readily available but custom sizes are available. View our preconfigured layouts or create your own work platform using the components listed. Use equipment crossovers to bypass obstacles that would normally block pedestrian foot traffic. 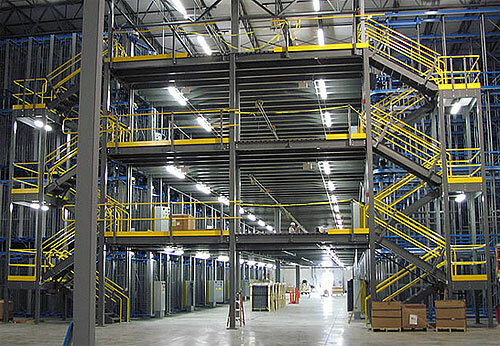 Uses pallet rack uprights as the support structure to create a solid and secure mezzanine. Perfect for maxing out available storage space above and below the mezzanine level. Ideal for order picking operations, shelf supported mezzanines create a very dense and sturdy storage area allowing you to hand stack at previously unreachable heights. Combine a mobile ladder with a standard work platform. Perfect for maintenance and assembly on large jobs. A variety of gate styles that let you load/unload mezzanines from the floor using a forklift.